It was a long war. A hard war. A sprawling war between hundreds of worlds, in which millions of lives were lost... and for what? For all the usual reasons, really. Power. Pennies. Practicalities. Politics. But at bottom, words were what caused the war between the Central Worlds and the Peripheral Systems: the words of two essentially identical texts, precious as they proved to people on both sides of the divide. But now the war is over. Scurelya Timsuk Shunde, the not-entirely-reliable narrator of Alastair Reynolds' new novella, is a soldier captured after the close of this conflict by a man who takes pleasure in other people's pain. "Normally there's not much pain. The medics use a topical anaesthetic to numb the entry area, and the slow bullet puts out another type of drug as it travels through your insides. It goes very slowly, too—or at least it's meant to. Hence the name, of course. And it avoids damaging any vital organs or circulatory structures as it progresses to its destination, deep enough inside your chest that it can't be removed without complicated surgery. But this one's different. It's going to hurt like the worst thing you've ever known and it's going to keep burrowing through you until it reaches your heart." Scur doesn't expect to survive this evil ordeal, but she does. Just. There are more pressing matters at hand, however, than Scur's indeterminate sincerity. Something's gone wrong, you see. The ship isn't where it's supposed to be, or when; it's drifting in deep space and unable to communicate the details of its strange situation—not because the necessary systems have been damaged, but because, in all the unfathomable vastness of the galaxy, there doesn't seem to be a single sign of life left. That is assuming the readings are right—and they mightn't be. They were taken by Prad, an engineer pressganged into Scur's service who has every reason to deceive the war criminals on the skipship. But most of the other crewmembers who might've had a clue what to do died in their hibos, so Scur has to take his explanation on faith—just as we've had to swallow hers whole—the better to save the last remnants of the human race. The last remnants of the human race are more interested in infighting, unfortunately, than in agreeing to disagree over their differences. And as if Scur didn't have enough to deal with, somewhere among them is a man who means to murder her. An old enemy, as it were. Obviously, I'm talking about Orvin. Slow Bullets represents an embarrassment of riches in its setting and its story, not to mention the many facets of the metaphor its telling title describes, which comes to mean misery, memory and more. It's a tremendously impressive novella in that sense; wicked ambitious... yet its beginning and ending—the mark it ultimately makes—depend to a certain extent upon the dynamic between our heroine and the aforementioned hellion. Make of that what you may. Me, I had Orvin figured for a villain from the first, and alas, that's all he ever is. As Scur says—albeit about another character—he "had been shaped for this one purpose, engineered like a tool to do one thing and do it properly." (p.124) In his defence, Orvin does indeed do one thing... but that's it for him. To make matters worse, Orvin—or the absence of Orvin—is one of the more memorable characters in this narrative. The others are similarly slight, or thinner still. Prad, for instance, plays his supporting part so passively that he feels more like a font of information than a living, breathing being. All the same, I'd take him over the Trinity—the representatives Scur arranges to speak for the opposing forces that find themselves sharing the skipship—and they're meant to be major players. In a standard short story, I dare say this lacking lot could come off okay, but in a novella approximately ten times the length of said, they drag down what is otherwise—and let me stress this especially—an excellent effort from one of British science fiction's finest. The plot is punchy, stuffed full of surprises that speak to the text's deceptive depth, and deftly executed excepting an ending that feels unearned. 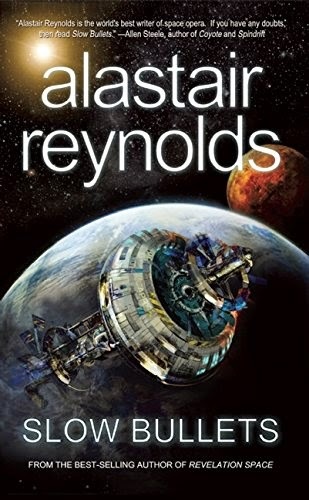 Even better: the big, bold ideas Alastair Reynolds must be most known for come thick and fast—from the slow bullets themselves to a race of aliens made of mirror glass, there's more than enough to distract from the undercooked cast.